Today’s Holidays dinners are all about quick and versatile dishes, without forgetting some old classics additions. Why make it an overwhelming task? This is an inspiring dish with a double take, meaning you can serve it conveniently easy as a salad or as an appetizer. 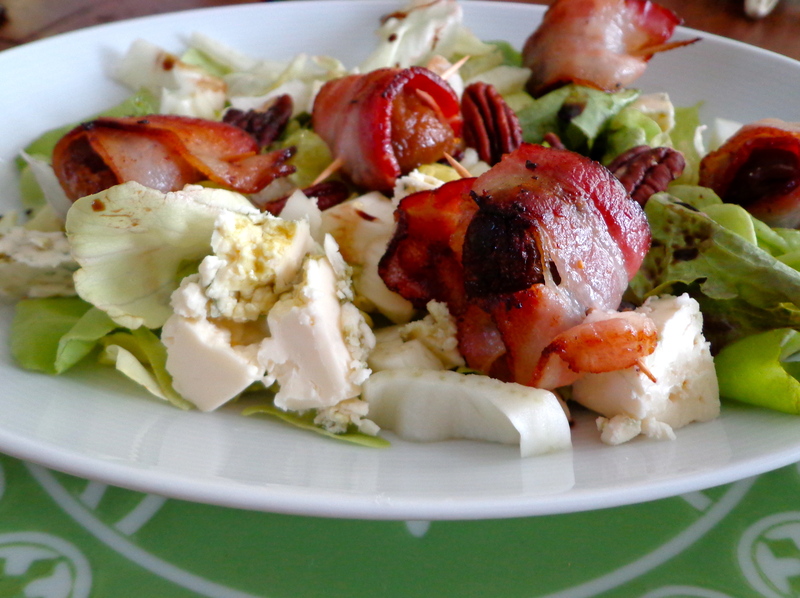 Deliciously mixed together the greens, blue cheese and the savory bacon wrapped figs make a a savory mix for a stand up nibble or a sitting down salad. Once you have decided how to serve it, adjust the ingredients to 3 or 4 bacon wrapped figs per per person if you go for an appetizer, or less if you will serve it as a salad. It is simple and delicious and it will satisfy all appetites and make your feast very enjoyable to everyone! Wrap each figs in half slice of bacon, overlapping it and securing it well with a toothpick. Heat a large skillet over medium heat and cook the figs turning them until the bacon is well browned and crisp on all sides. Transfer to a plate, cover and keep warm in the oven. In a large bowl toss the greens with olive oil first, adding 1/2 tablespoon of salt, add vinegar, and generously sprinkle and toss with ground pepper. Crumble with your clean hands the cheese and mix. When ready to serve ( as a salad) add greens to the plate, place to figs over each plate, seson figs with pepper and serve. Chefs Tips: It is a lukewarm salad, to be served immediately, yet you can roll figs and bacon ahead of time and keep them covered and refrigerated for severals hours. Let them return to room temperature before preparing and serving, (courtesy of Michel MacLaughing).